It doesn’t matter how many times we enjoy this hour long circular dog walk, the view, light and landscape always stop us in our tracks. 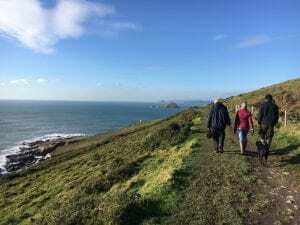 We’re reminded why The South Hams in South Devon is an Area of Outstanding Natural Beauty. Golden gorse is out everywhere on our short drive from dog-friendly Watermill Cottages in 20 acres of secret stunning, coastal valley, down through pretty Slapton village with its medieval tower, between the sea and freshwater Slapton Ley to Torcross and into the next bay, following signs to Start Point and Lighthouse. 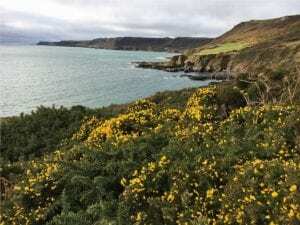 We stroll down the cliff path from the Start Point car park between hedges of coconut-scented gorse towards the sea. May the dog is loving this too! The sea sparkles ahead before a panorama of foamy coast opens up, scalloped into bays and headlands. Sunbeams make the rocks and waves glitter. Secret Dog-Friendly Beach. Mattiscombe Sands, our favourite secret local beach, is reached by stepping down the cliff path from here. There are rock pools to play in, a freshwater stream for the dogs, black outcrops biting the sky for drama, waves for percussion. And south-facing, so a sun trap even in winter as it’s protected from the cooler easterlies. 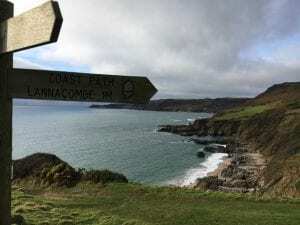 The signpost invites us down, or to continue along The Coast Path to tiny Lannacombe beach or further west. With short light in early Jan, we turn east and walk around the cliff slopes to look for seals at Pear Tree Point rocks. We’ve often watched seals and their pups watching us, almost human with such expressive eyes, but today there are no seals, just moody light and turquoise sea. It feels like very faraway. Start Point Lighthouse grows as we approach it around the headland. At first, a huge white match wedged into the cliff, then prouder and larger. Walkers taking the anti-clockwise route tell us they’ve seen seals. We stare and stare but really can’t persuade ourselves that that rock in the waves is a head! 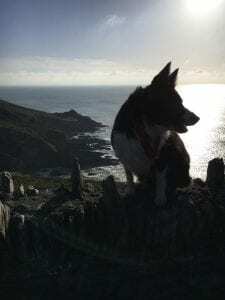 Reaching the spine of Start Point, its name derived from the Anglo-Saxon word steort, meaning tail, we gaze over the whole of Start Bay beyond and the choppy white waters of The Skerries beneath, the rocky reef that runs into the sea for 6.5 kms. It’s the reason for the lighthouse. 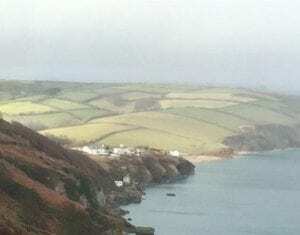 Soft sunshine illuminates the coastal villages of Hallsands and Beesands, and the ruins of the Hallsands houses that were washed into the sea a century ago. A mosaic of small hedged fields decorates the soft hills between the bays. Slapton Ley shines behind the shingle bank that keeps the sea out, mostly. Far distant is the Dartmouth daymark, pointing out the harbour entrance. We walk up the tarmac slope, choosing not to visit the lighthouse today, eyes right as li ght dances and changes our focus. Dog Friendly Pub Advice. And a short drive to Beesands beach – we could have walked, but light is short and lunch is calling! Crab soup and whitebait at The Cricket Inn, with May the dog, after a bit of ball throwing, of course. 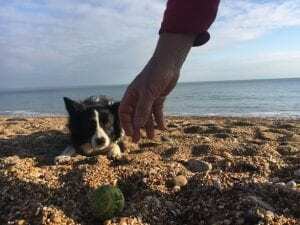 Short breaks from £245 at one of the five dog-friendly Watermill Cottages set in a secret, traffic-free valley behind Slapton nr Dartmouth, from January to the end of March 2019. Call Christine & John on 01803 770219 or enquire online. 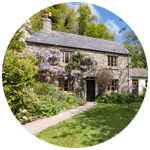 Come, breathe some clean coastal air and recharge your energy with a weekend or midweek short break in a cosy South Devon cottage with wood burner at dog-friendly Watermill Cottages in the stunning Gara Valley near Slapton Sands. In the heart of South Devon AONB and near the SW Coast Path. 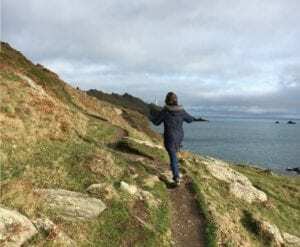 Valley strolls on green lanes, beach walks and great views or explore Dartmouth, the sailing town, quaint Totnes and pretty South Hams villages. Lots of cream tea and dining options from beach shack to cosy cafes & pubs, with excellent restaurants serving local specialities. And a log fire to come home to. Snowdrops. 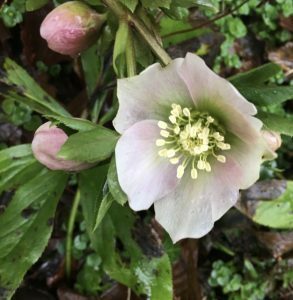 primroses and violets are coming out, hellebores and heliotropes are in bloom. The air is so pure here that the trees glow with lichen. At dawn, the valley fills with birdsong. At dusk, it’s owls we hear. 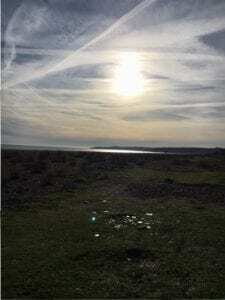 Our beaches are so uplifting early in the year, our valley so peaceful. Come, relax and unwind – call Christine and John on 01803 770219 to book your short break before Easter – prices start from £245. Or send us an enquiry form. Easter holiday? Help feed the lambs at Watermill Cottages.